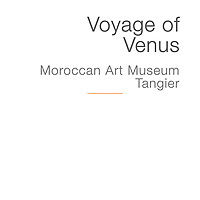 Pictures & images of the The Voyage of Venus, a Roman mosaic from Volubilis , Museum of Moroccan Arts and Antiquities, Dar el Makhzen , Tangier, Morocco. The museum is housed in the Dar-el-Makhzen (or Sultanate Palace) in Tangier. The Voyage of Aphrodite, or Venus, is a Roman mosaic from Volubilis archaeological site in Morocco. 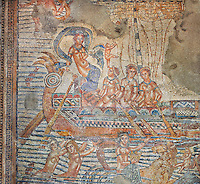 The well preserved Roman mosaic depicts Venus in a richly decorated ship being rowed by naked oars women . 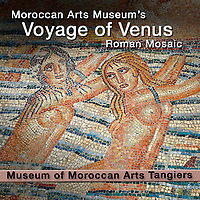 Pictures and images of Roman Mosaic exhibits from the Museum of Moroccan Arts and Antiquities can be bought on line as photo art prints or downloaded as high resolution stock photos.